Abraham is Told to Offer His Son Isaac as a Burnt Offering! The LORD tested Abraham by telling him to sacrifice his son Isaac as a burnt offering. This event is a prophetic picture of the sacrifice of God’s Son. How much time later is not clearly expressed in the Scriptures. In the previous chapter we are told that Isaac had been weaned. His mother Sarah gave birth to him when she was ninety years old. Isaac may have been 3-5 years old at that time. Genesis 21 also records that Abraham stayed in the land of the Philistines for a long time. 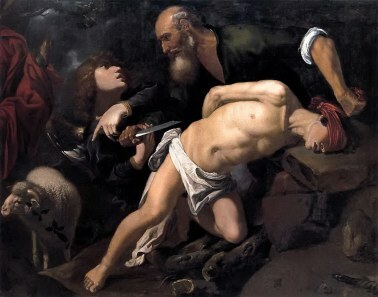 Some paintings portray Isaac as being just a boy at the time Abraham was called by God to offer up his son as a sacrifice. But this is very unlikely to be true. In one trip, a mere boy would not be able to climb up a mountain carrying a load of wood sufficient to fuel a fire large enough to consume a burnt offering. Abram who had lived in Ur of the Chaldeans for 75 years is recorded to have stayed in the land of the Philistines for a long time. If Abraham only dwelled in the land of the Philistines for 10 years, Isaac would have been at least 13-15 years old. Sarah who gave birth at ninety, according to Genesis 23:2, was a hundred and twenty-seven years old when she died. Therefore it is possible that Isaac may have been a man in his thirties when he carried the wood for the burnt offering up the mountain. One thing we know for sure, Isaac was definitely not a child. God told Abraham to take his “only son” Isaac to the region of Moriah. Yet we know that Abraham had another son Ishamael at that time. When Ishmael and Hagar were sent away it was clear that Ishmael was not to be the rightful heir, but it is also clear that Ishmael would remain Abraham's son. God said, “Nevertheless, I will make the slave girl's son into a nation, since he, too, is your offspring” (Genesis 21:13). Ishmael, though loved by Abraham and an offspring from his body, was not the promised heir. Isaac alone was the heir. He was the “only son” of the promise. Father Abraham was told to take his “only son” whom he loved and sacrifice him on a mountain in the region of Moriah. Abraham lost no time in obeying God’s command. Early the very next morning he arose and made the necessary preparations for the trip. There would be little brush at the top of a mountain, so Abraham needed to bring the wood with him. Although he had servants, Abraham cut the wood himself because this was to be a personal act of sacrifice. He took two of his servants along with him and his son on the journey. Two is the number of witness and testimony. Abraham’s servants would serve as witnesses to his faithfulness to obey the LORD. According to Torah, the burnt offering was an obligation but could also be a voluntary offering. The animal to be offered up was to be a male without defect. When offered by an individual, the person was to lay his hand on the head of the animal as an act of symbolically transferring his sins to the animal. The burnt offering was an offering for atonement. With one swift cut across the throat, the animal was killed and the blood poured out into a basin. The carcass was flayed and the then the body cut into pieces. The offering was totally consumed by fire and regarded as ascending up to God. The burnt offering represented total submission and commitment to God. It took three days to reach the mountain of sacrifice. Abraham did not lift up his eyes until the third day. During the course of this journey Abraham grieved and was downcast in his spirit knowing that his beloved son was supposed to be sacrificed. Yet, Abraham told his servants that he after Isaac had worshipped and the sacrifice had been offered, that they both would return. Jesus said in Luke 22:42, “Father, if it is Your will, take this cup away from Me; nevertheless not My will, but Yours, be done.”Jesus submitted to the Father’s will and humbled himself by becoming obedient to death—even death on a cross (Philippians 2:8b). Although it was the angel of the LORD who called out to Abraham from heaven, he said that I know you fear God because you have not withheld your son from “me”. It was God who told Abraham to make the sacrifice, yet the angel of the LORD said that you have not withheld your son from me. This is another instance of the appearance of the pre-incarnate Christ as the angel of the LORD. This holiday, The Feast of Trumpets (Yom Teruah), is popularly known as Rosh Hashanah meaning the “Head of the Year” or Jewish New Year. According to the ceremonial calendar, it is the first day of the seventh month. Although the Jewish exiles returned from Babylon to the Promised Land on the first day of the fifth month (Ezra 7:9), they gathered together on Rosh Hashanah in Jerusalem on the first day of the seventh month (Nehemiah 7:73). At that time they heard the words of the Torah/Law translated and explained to them by Ezra and the Levites. After living for seventy years as an enslaved people, finally Jewish society was to again be governed by the commandments, regulations and ordinances of Mosaic Law. 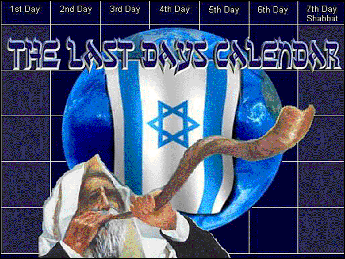 Therefore, the Jewish Civil Calendar commences on the first day the seventh month on the Hebrew Calendar. Much the same way in our culture, though January marks the first month of the year, some businesses and government agencies calculate the fiscal year beginning in April. The liturgy in synagogues around the world not only includes the reading of the same biblical accounts on each Sabbath, but the same passages are read each year on each of the Festivals of the LORD. On Shavuot (The Feast of Weeks/Day of Firstfruits), the Book of Ruth is read because it concerns the harvest. On Rosh Hashanah, the Binding of Isaac is the Torah passage that is read in every synagogue throughout the world because it concerns a ram's horn: Abraham looked up and there in a thicket he saw a ram caught by its horns (Genesis 22:13a). At the New Moon festivals and appointed feasts, trumpets were sounded. According to God's command (Numbers 10:2), two silver trumpets were to be fashioned. They were to be used for calling the community together and for announcing that the camps set out. According to the Law of Moses, trumpets are sounded to gather God's people into His presence. 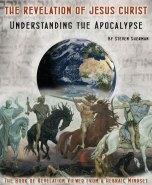 They were sounded to announce the setting out of the camps as each of the Israelite tribes followed the Pillar of Cloud by day and the Pillar of Fire by night. Trumpets herald the approaching of a king. They are sounded when a battle is to take place. At the Feast of Trumpets, God's elect will be translated in the blinking of an eye and gathered into His presence to be forever with the Lord. Abraham which means “Father of Many” would be the patriarch of numerous natural children through both Ishmael (the Arabic tribes), as well as through Isaac (the tribes of Israel). Abraham is not only the father of many natural children, but also the father of many spiritual children who by faith have undergone the circumcision of their hearts (Romans 4:11-12). Matthew chapter one and verse one reveals how all nations on earth will be blessed through the offspring of Abraham: This is the genealogy of Jesus the Messiah the son of David, the son of Abraham. Jesus the Messiah who is the seed of Abraham blesses the elect of God from all nations under the heavens. Born-again believers in Messiah are blessed with forgiveness of sins and eternal life, with love, joy and peace, with grace and mercy, and every spiritual blessing in the heavenly realms.